It's YOUR installation, get a larger inverter if you like. I can understand the smaller inverter, but you could also be limiting your output. The trick is finding the sweet spot. What do other installers/designers in your area use for a ratio? If you have records you can graph them and estimate how much you are losing. Then you can decide whether it's worth the expense of an upgrade. You could split your strings and install a second (say 2.5k) inverter beside the first. It would entail some wiring changes but it MIGHT save money over replacing the inverter. Talk to a local installer. If you have records you can graph them and estimate how much you are losing. Then you can decide whether it's worth the expense of an upgrade. You could split your strings and install a second (say 2.5k) inverter beside the first. It would entail some wiring changes but it MIGHT save money over replacing the inverter. Talk to a local installer. Please find what i am getting right now on a screenshot. It's not looks right to me and i believe during summer time it will be worth. I still did not finish project and i believe installer suppose to fix this. This is not my fault. The dip from 10 to 11 is probably shading or clouds, but the flat top is very suspicious. It definitely looks like "something" is limiting your output. From what you have said, my first guess would be the inverter. What is your installer's explanation? I'd print out several days of this data, find a local expert and talk to him. Rick, as the EET, what is your opinion? "You could split your strings and install a second (say 2.5k) inverter beside the first. It would entail some wiring changes but it MIGHT save money over replacing the inverter. If he is going to be left on the hook to fix this, He could get the bigger unit and keep the old on hand as an emergency replacement if/when the other fails. No where near enough information to form an opinion. Don't know what his equipment is. 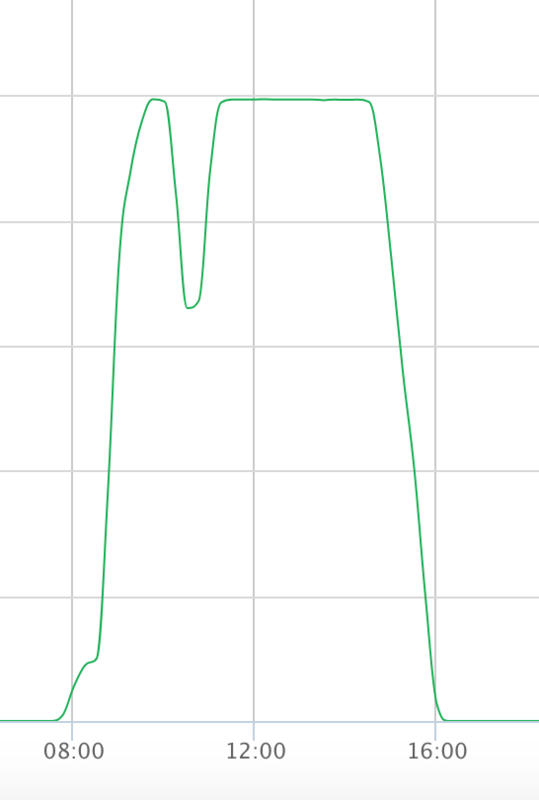 Don't know what that graph is. Don't know what the vertical scale is or the vertical units on that graph. I could make a lot of assumptions and form a wild guess, but not what I would consider an opinion. No Charge Controller and Battery Bank ... must be a grid connect with no storage. Now the graph make sense. It peaks at 5K which is the maximum transfer rate of the SolarEdge HD-Wave SE5000H. As for the mid-morning dip, that could be two things. 1. Shading at your location is causing your production to drop. 2. In your area, the demand for electrical energy drops mid-morning. The reason, why i created this post, i need to understand if i need to talk with installer to replace inverter with bigger transfer rate. I see, that my solar array can produce more, event right now, during the winter time. A third possible reason for the mid-morning dip, your consuming energy at a faster rate then you producing it.